Public Service Commission Hearing on Keystone XL in O’Neill	TS Radio: Professional Predatory Guardians: The perfect job for psychopaths? Although I have just been doing my scholarly, unbiased, science-based duty to warn (that is in direct opposition to the highly biased, indeed perverted, corporate “science” of Big Pharma that we all know is really in the game just because of the money), I have just received my first “death threat”. It came in the form of a blog post at Transcend Media Services, a European peace and justice website that regularly publishes my Duty to Warn articles. Knowing the truth of the old phrase “You Know You‘re Over the Target, When You‘re Catching Flak”, when I receive attacks about something I wrote that is firmly backed up by irrefutable science, I feel motivated to continue doing my part to bring some truth to the seriously compromised healthcare non-system of America, which has been usurped by corporate entities such as Big Pharma, Big Insurance and Big Finance that meet the definition of sociopathic personalities. But, knowing the history of how progressive movements are usually stifled before they acquired power, it bothers me when I recall that so many prophetic voices throughout history have been silenced by death threats, by ad hominem attacks, by character assassinations, by smear campaigns, by threats of being fired from their jobs and, if the hero persists, actual assassination attempts (include being “suicided”) that come from entities that have hidden, but very ruthless agendas. There are many progressive whistle-blowers and groups that many of us admire for doing courageous duty in the face of organized police state violence. Think suffragettes, anti-slavery abolitionist activists, antiwar activists, civil rights activists, feminist movement activists, gay rights activists, environmentalists, native American water protectors, etc, etc. And think of the tens of thousands of parents of vaccine-injured or vaccine-killed babies and children (and now consider the thousands of Gardasil-injured or killed young women who received that $130 per shot vaccine because the Merck corporation (of Vioxx infamy) claimed – totally theoretically – that 20 or 30 years in the future their risk of getting cancer of the cervix would possibly be lessened. When the future of the planet and the futures – or health – of their children are at stake, courageous parents whose innocent children were harmed, are very willing to stand up and speak out even if it attracts flak from inanimate, non-human realities like governmental, pharmaceutical and media corporations. They are even willing to be abused and harassed – even shot at, by those conscienceless corporation’s highly-paid, potentially vicious mercenary armies that hire ex-special ops military veterans – as was the case with the pipeline industry at Standing Rock recently. These corporate entities, probably starting with their ubiquitous right-wing think tanks, have ulterior motives, very deep pockets and the complete cooperation of the major media – who are dependent on their prestige, largesse and, of course, advertising revenue. But I really care about the many progressive heroes who have actually been assassinated when their courageous messages got too close to the truth. Some examples of the assassinated progressive thinkers include Jesus of Nazareth, Mohandas Gandhi, Jack Kennedy, Martin Luther King, Bobby Kennedy and Paul Wellstone. Those dastardly acts surely happened because they were starting to annoy their respective Deep State entities because of their unwelcome truth-telling. Many people think that if the peace-making, anti-war, social democrat Bernie Sanders had become president of our war-mongering, police state nation, he would surely have been marked for figurative or literal assassination. Anyway, here is the quasi-“death threat” (if condemning me to hell qualifies as a death threat) that I recently received from a drastically uninformed reader who had obviously swallowed – hook, line and sinker – the wide-spread myth that vaccines were totally responsible for stopping previously lethal infectious diseases. (Anyone who knows thoroughly the real history of vaccines knows that the lethality of many infectious diseases had already disappeared by the time the vaccines were introduced to the public. Specifically, smallpox disappeared in spite of the fact that only 10% of the world’s population ever received a small pox vaccination. The writer of the letter obviously had never really read what I and so many other unbiased experts and scholars had written, and she obviously had fallen for the propaganda from Big Pharma (or the co-opted regulatory agencies like the subsidiaries of the CDC, the FDA, the NIH, etc). 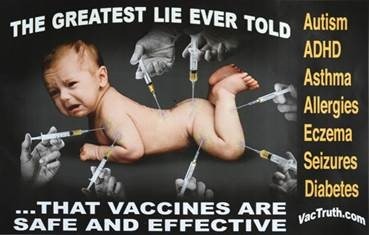 She also did not reveal her connections to the vaccine industry nor to the medical clinics that, based on their silence on this serious topic and their willingness to demean and even fire patients who distrust Big Pharma’s over-vaccination agendas for their children, must be very interested in inoculating their infants, children and adult patients with the 270 new vaccines that are in Big Pharma’s pipeline – soon ready to propagandize their importance for the public health. You have been posting a string of unscientific horsesXXX about vaccines, and THIS is all you can come up with? Go to hell with the rest of the genocidal anti-vax psychpaths. To the editors: Diseases such as smallpox, polio and so has killed more than half a billion humans in the last centuries. More than all wars combined. Diseases that are preventable with vaccines. You are lending a hand to a psychopathic movement that want us to go back to those times where (mostly poor) people died due to lack of vaccines. Why are you supporting these genocidal nuts? Thank you for another informative and enlightening article. You wisely disarmed potential nonsensical critics with your apt series of lead-in quotes–from some of the great thinkers. That is: you “disarmed” those wise enough to contemplate your message; to respect your research and your dedication to the Hippocratic Oath and the Precautionary Principle. That dedication is manifest in this article (and in others that I have read by you). You are sensibly calling attention to the destructive Power of Ignorance, and, in particular, lamenting “ad hominem” attacks that merely highlight the assailant’s paucity of wit or knowledge. Such attacks have become quite the norm in the US political system during the past 2 years. Rather than look for some “common ground”– (Johann) Galtung often asks: “What is your vision? How can we share?–rather than look for space to share, for the common good, the US public is dividing along “totally correct” and “totally false” narratives; and identifying simplistically as “good guys” or “bad guys.” Miss the subtleties of thoughts and emotions and surely we miss the range of qualities that make us human! In short, we not only “miss the point,” we dehumanize “the other” and ourselves! Keep on keeping on, Dr. Kohls! Whether you write cogently about our corrupt political system, our misconstrued history, muddled media, or an exploitative medical-pharmaceutical-dental system, you write clearly, incisively and honestly. And below are assorted quotes from concerned, unbiased scientists (who have resisted becoming affiliated with the corrupted vaccine industry) regarding the unequivocal neurological damage from the various highly neurotoxic vaccine ingredients, such as mercury and aluminum. But remember, it isn’t just kids being adversely affected by neurotoxins; it’s also the older generation who have their own CDC-recommended vaccine schedule. And the evidence is that Alzheimer’s Disease has important vaccine-induced neurotoxicity as a factor. …A review of the epidemiological and clinical evidence linking aluminium to Alzheimer’s disease (AD) is presented. The article discusses the role of aluminium in two mechanisms that have been linked to neurodegenerative disorders, including AD…The results discussed here have broad implications for the role played by aluminium and other metals in neurodegenerative diseases, and suggest that long-term exposure to supra-physiological amounts of these metals should be avoided. Industrialized societies produce many convenience foods with aluminum additives that enhance various food properties and use alum (aluminum sulfate or aluminum potassium sulfate) in water treatment to enable delivery of large volumes of drinking water to millions of urban consumers. The present causality analysis evaluates the extent to which the routine, life-long intake, and metabolism of aluminum compounds can account for Alzheimer’s disease (AD), using Austin Bradford Hill’s nine epidemiological and experimental causality criteria, including strength of the relationship, consistency, specificity, temporality, dose-dependent response, biological rationale, coherence with existing knowledge, experimental evidence, and analogy. Mechanisms that underlie the risk of low concentrations of aluminum relate to (1) aluminum’s absorption rates, allowing the impression that aluminum is safe to ingest and as an additive in food and drinking water treatment, (2) aluminum’s slow progressive uptake into the brain over a long prodromal phase, and (3) aluminum’s similarity to iron, in terms of ionic size, allows aluminum to use iron-evolved mechanisms to enter the highly-active, iron-dependent cells responsible for memory processing. Aluminum particularly accumulates in these iron-dependent cells to toxic levels, dysregulating iron homeostasis and causing microtubule depletion, eventually producing changes that result in disconnection of neuronal afferents and efferents, loss of function and regional atrophy consistent with MRI findings in AD brains. Alzheimer’s Disease is a human form of chronic aluminum neurotoxicity. The causality analysis demonstrates that chronic aluminum intake causes Alzheimer’s Disease. A great deal has been learned about the neurotoxicity of aluminum over the past two decades in terms of its ability to disrupt cellular function. Newer evidence suggests that a more central pathophysiological mechanism may be responsible for much of the toxicity of aluminum and aluminofluoride compounds on the brain. This mechanism involves activation of the brain’s innate immune system, primarily the microglia, with a release of neurotoxic concentrations of excitotoxins and pro-inflammatory cytokines, chemokines and immune mediators. A large number of studies suggest that excitotoxicity plays a significant role in the neurotoxic action of a number of metals, including aluminum. Recently, researchers have found that while most of the chronic neurodegenerative effects of these metals are secondary to prolonged inflammation, it is the enhancement of excitotoxicity by the immune mediators that is responsible for most of the metal’s toxicity…This paper reviews the evidence linking immunoexcitotoxicity to aluminum’s neurotoxic effects. Aluminum (Al) is a recognized neurotoxin causally linked to several neurodegenerative diseases with a dementia component. Al has long had a GRAS (Generally Recognized As Safe) rating by the US FDA, that allows Al salts to be used in food manufacture and clarification of urban drinking water supplies. Routine ingestion of Al salts throughout life causes bioavailable Al to accumulate in the brain where it specifically deposits in regions most vulnerable in Alzheimer’s disease (AD). AD has an insidious onset, developing slowly and progressively, producing cognitive deterioration in old age…a study revealed that a significant proportion of rats, particularly those that consumed Al in an equivalent amount to the high end of the human total dietary Al range, progressively accumulated Al in their brain, accompanied by AD-related neuropathology and cognitive deterioration in old age. This article describes evidence for the close involvement of Al with the major AD hallmarks and provides suggestions that may help to remediate the current AD epidemic in westernized countries. Aluminium (Al) is a neurotoxic metal and Al exposure may be a factor in the aetiology of various neurodegenerative diseases such as Alzheimer’s disease (AD). The major pathohistological findings in the AD brain are the presence of neuritic plaques containing beta-amyloid (Abeta) which may interfere with neuronal communication…Chronic exposure over 12 months to aluminium sulphate in drinking water resulted in deposition of Abeta similar to that seen in congophilic amyloid angiopathy (CAA) in humans and a reduction in neuronal expression of GRP78 similar to what has previously been observed in Alzheimer’s disease. So, we hypothesise that chronic Al administration is responsible for oxidative cell damage that interferes with functions inducing Abeta accumulation and neurodegenerative damage. A recent longitudinal study described an inducible rodent model for age-related cognitive deterioration. This model was produced by chronically feeding rats aluminum, from age 12 months onwards, in measured amounts equivalent to total aluminum levels ingested by Americans from their food, beverages and aluminum additives. The rats performed a hippocampal-dependent spatial memory discrimination task weekly throughout middle age and old age. One-third of the rats attained significantly lower mean performance scores in old age than middle age, in an aluminum dose-dependent manner, and exhibited behavioral signs observed in dementia. The present study used histological and immunohistochemical techniques to identify neuropathological difference between brains of rats that showed cognitive deterioration and the cognitively intact controls. Most aged rat brains had large numbers of aluminum-loaded pyramidal cells in their entorhinal cortex and temporal association cortex but the cognitively deteriorated rats had threefold more such cells than controls (p<0.01). A distinguishing feature was that all brains of the cognitively deteriorated rats, and none of controls, had at least one substantial hippocampal lesion that consisted of aluminum-rich microtubule-depleted pyramidal cells with shriveled processes, and loss of synapse density. Corticolimbic sections from brains of humans with Alzheimer’s disease also showed neuropathology consistent with this type of damage. The evidence suggests bioavailable aluminum gradually accumulates in cortical and limbic regions of susceptible subjects’ brains, eventually producing hippocampal lesions consisting of dysfunctional aluminum-rich microtubule-depleted pyramidal cells with damaged neurites and synapse loss. These lesions expand over time, disrupting afferent and efferent hippocampal circuitry with the development of clinically overt dementia. Recent epidemiological, neuropathological, and biochemical studies have suggested a possible link between the neurotoxicity of aluminum and the pathogenesis of Alzheimer’s disease. However, this relationship remains controversial. To investigate detailed characteristics of neurotoxicity of aluminum, we used primary cultured neurons of rat cerebral cortex as an in vitro model system for the observation of morphological changes induced by chronic exposure to aluminum. Although the exposure to aluminum chloride (10-100 microM) for 1 week did not cause marked neuronal death, degeneration of neuritic processes and accumulation of tau protein and beta-amyloid protein appeared after chronic exposure to 50 microM aluminum chloride for more than 3 weeks. We also investigated the polymerization of beta-amyloid protein in vitro using the immunoblotting technique. We thus found that aluminum induced conformational changes in beta-amyloid protein and enhanced its aggregation in vitro. The aggregated beta-amyloid protein was dissolved by the addition of desferrioxamine, a chelator of aluminum. The aggregated beta-amyloid protein pre-incubated with aluminum formed fibrillar deposits on the surface of cultured neurons. Once biologically available aluminum bypasses gastrointestinal and blood-brain barriers, this environmentally-abundant neurotoxin has an exceedingly high affinity for the large pyramidal neurons of the human brain hippocampus. This same anatomical region of the brain is also targeted by the earliest evidence of Alzheimer’s disease (AD) neuropathology. The mechanism for the selective targeting and transport of aluminum into the hippocampus of the human brain is not well understood. In an effort to improve our understanding of a pathological aluminum entry system into the brain, this study examined the aluminum content of 8 arteries that supply blood to the hippocampus, including the aorta and several cerebral arteries. In contrast to age-matched controls, in AD patients we found a gradient of increasing aluminum concentration from the aorta to the posterior cerebral artery that supplies blood to the hippocampus. Primary cultures of human brain endothelial cells were found to have an extremely high affinity for aluminum when compared to other types of brain cells. Together, these results suggest for the first time that endothelial cells that line the cerebral vasculature may have biochemical attributes conducive to binding and targeting aluminum to selective anatomical regions of the brain, such as the hippocampus, with potential downstream pro-inflammatory and pathogenic consequences. …We examined in vivo effects of aluminum on amyloid precursor protein (APP) in aged rats, obtained from previously-reported longitudinal studies, that chronically ingested aluminum in amounts equivalent to total dietary aluminum levels that Americans routinely ingest…This study shows aluminum routinely derived from chronic oral ingestion, that gradually accumulates in brain regions important for memory-processing, is sufficient to increase APP levels in neural cells of those regions. Aluminum may thus launch the cascade that results in the formation of amyloid plaques in human brain. … Mitochondrial preparations from aluminium-treated rats revealed significant decrease in the activity of various electron transport complexes…in the hippocampus region…This decrease in the activities of electron transport complexes in turn affected the ATP synthesis and ATP levels adversely in the mitochondria isolated from aluminium treated rat brain regions…The present study thus highlights the significance of altered mitochondrial energy metabolism and increased ROS production as a result of chronic aluminium exposure in different regions of the rat brain. …Aluminum (Al), lead (Pb) and mercury (Hg) were reported to alter Calcium (Ca)-regulated events thereby causing neurotoxicity. Hence, an attempt was made characterize IP3 mediated Ca2+ release from rat brain microsomes under the influence of Al, Pb and Hg…All the three metals inhibited inositol trisphosphate (IP3)-mediated Ca2+ release, Pb being more potent. The order of potency of these three metals was Pb>Hg>Al…These results suggest that neurotoxicity exerted by Al, Pb and Hg may be due to the interference of these metals with IP3 mediated calcium release and also interfering with the microsomal Ca2+ sequestration mechanism. Dr. Kohls is a retired physician who practiced holistic, non-drug, mental health care for the last decade of his forty year family practice career. Prior to his retirement, he was a member of Mind Freedom International, the International Center for the Study of Psychiatry and Psychology, and the International Society for Traumatic Stress Studies. While running his independent clinic, he published over 400 issues of his Preventive Psychiatry E-Newsletter, which was emailed to a variety of subscribers. (They have not been archived at any website.) In the early 2000s, Dr Kohls taught a graduate level psychology course at the University of Minnesota Duluth. It was titled “The Science and Psychology of the Mind-Body Connection”. Since his retirement, Dr Kohls has been writing a weekly column (titled “Duty to Warn”) for the Duluth Reader, an alternative newsweekly published in Duluth, Minnesota. He offers teaching seminars to the public and to healthcare professionals. Where would corruption governing, malpractice, law and judicial accomplice criminals be without their corruption conspired statutes, legislations and policies that separates, discriminates, places beneath, degrades, abducts, enslaves, swindles, poisons, rapes, robs and murders the people by force? Arresting prognosis, disorder, illness & diagnosis fabrecating drs, specialists, psychologists, psychiatrists, chemists/pharmacists, nurses, social workers, attorneys, judges & senators FUNDING/PARTICIPATING/DEPENDANT on medical/legal swindeling, ABDUCTING; poison & neglect assaults damaging, debilitating, robbing & homicide murdering healthy property/land owners to rob their families money for themselves. It seems to me the two BIG population “controllers” are OIL and VACCINES…..!